Hatch Chile Corn Chowder is creamy, rich, and just a little spicy. It’s perfect for the chilly, drizzly autumn days ahead. It’s quick and easy to make and it honestly gets better the next day. You might also like another of my favorites – Mexican Street Corn Soup! I love soup. When I was little we had the canned kind and we had it often. My mom was a wonderful woman but cook she was not. When Dad was on one of his many business trips out of town dinner was soup and sandwiches more likely than not. She did make a homemade potato soup that was amazing – I still use the recipe – but anything else? Oh, I am not complaining. I loved soup then and I love it now. It’s just that I really had no idea that you could make soup without the use of a can opener until I was in my own home and in my own kitchen. It was an eye-opening experience. Since that time I have made a lot of soup and experimented with a lot of recipes. 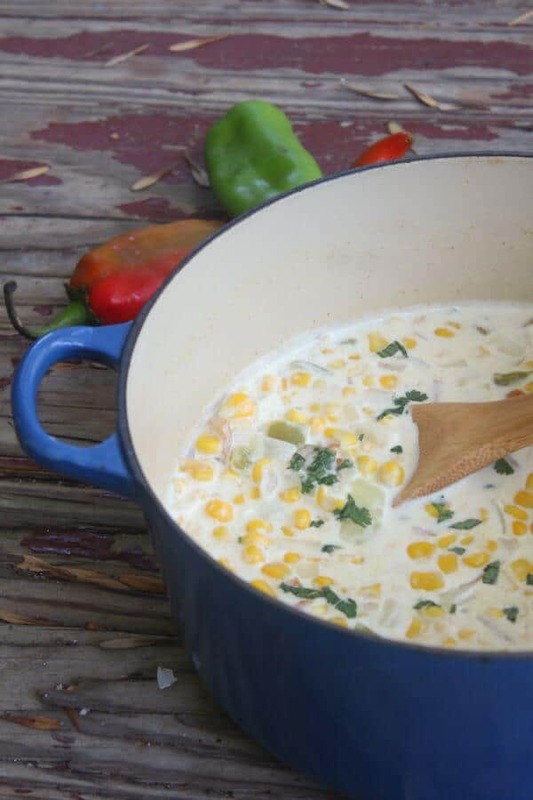 This easy Hatch Chile Corn Chowder recipe is one of my favorites. My oldest daughter’s favorite soup is corn chowder but I think she likes this version even better than the original. Hatch chiles have a distinctive flavor but if they are unavailable poblanos work just fine. If you like a little extra heat you can even pop some canned chipotle in adobo in there but be careful! 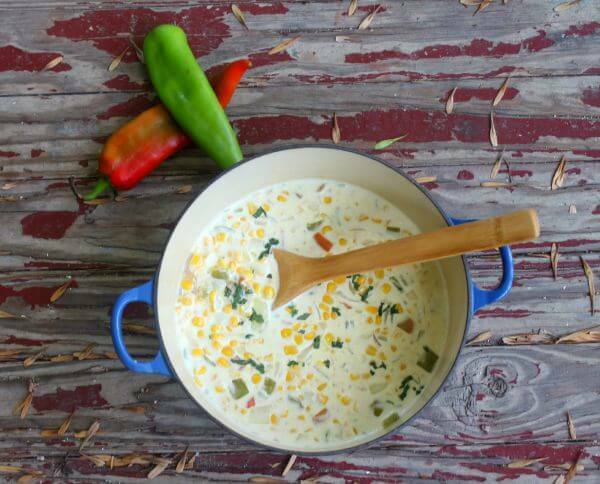 Creamy corn chowder with a Southwestern kick! Corn and Hatch chiles are simmered in a silky cumin scented broth for a filling soup that is both soothing and spicy. In a large saucepan sauté the onions and chiles in the butter. Stir in the flour and cumin. Cook over low heat, stirring constantly for a minute or two. Add the corn and chicken stock. While the soup is simmering mix the milk and cream cheese in a microwave safe bowl. Microwave for 2 minutes, stirring every few minutes, until the cheese has softened. Whisk smooth and add slowly to the simmering soup, stirring constantly. Heat through, being careful not to boil. So much love for Hatch chilies! It’s like a holiday for me when they’re in the stores & markets! Your chowder looks amazing – yum! Hatch chiles are the best. Need to give this a try soon! This looks great, now I need to find myself some hatch chiles! I have to be in the right mood for soup, and this Fall weather totally does it for me. Hatch chiles are just so warming, this sounds delicious! I love Hatch chiles! And I think I may be able to still get some good ones if I hurry. This looks positively fantastic!! My daughter loves corn chowder too – so I must make this, I haven’t seen Hatch chilies around so thanks so much for the tip to use poblanos instead! Poblanos are a good sub in most Southwestern dishes. I LOVE that you added cream cheese to this–gives it so much body and flavor. I am so ready for soup season! I am glad you mention the poblano sub–I know everyone loves hatch chiles, but I don’t think I have ever even seen one! Really? They are all over around here. I do love a little cream cheese in a cream soup, too! Once you start making your own soup, it is so hard to go back to anything in a can. I love the ease of this recipe and the flavors. I LOVE corn chowder, and I’m very excited to try a variation with hatch chiles!